The BF3126 and BF3127 Series of sunlight-visible, bayonet-base 6/7 LED cluster lamps are replacements for incandescent T3¼ miniature bulbs. 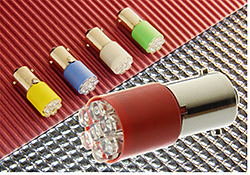 Available in blue, green, yellow, orange, red and white LED colors. They feature a 120-degree viewing angle. Rated at 100,000 hours MTBF for color light and up to 50,000 hours for white LED light.